The Chipotle Fax Order Form is a document used for a high quantity of burritos, burrito bowls, and taco orders to be selected ad purchased upon a pickup (generally takes about 30 minutes). There are 3 ways to order take-out from Chipotle: Telephone (Find Nearest Store), Fax, and Online. 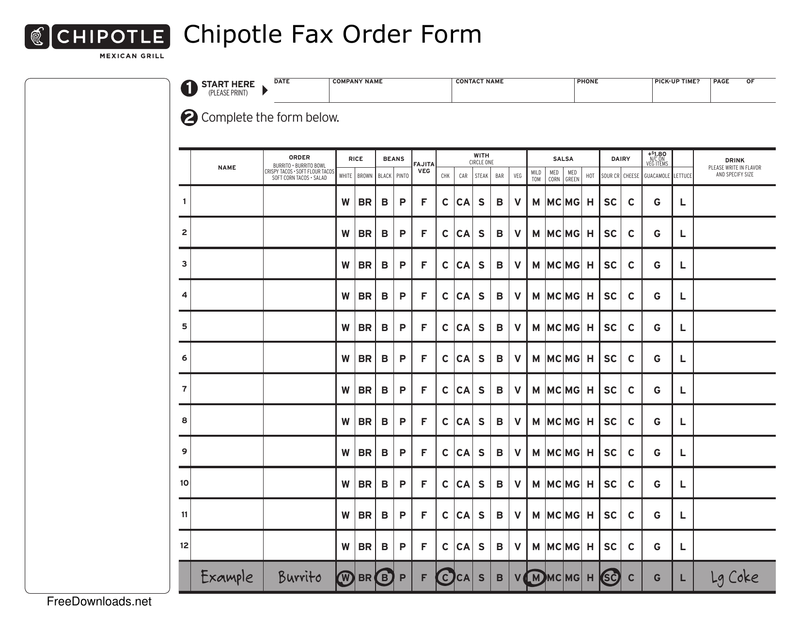 Step 1 – Download and Print the Chipotle Fax Order Form. Step 2 – Select what you would like to order (by circling). Step 3 – Find your nearest Chipotle Location and fax the order form to the store. Step 4 – Call the store shortly after to confirm that the order has been received and when to be at the restaurant.